Put some water in a saucepan. Add the peppercorns, bay leaves, carrot, onion, vinegar and the octopus. Cover with the lid and cook for 30 minutes until the octopus is tender. Then strain and cut it into pieces. Cut the avocado into pieces and put it in a bowl. Add the lime zest, spring onion, spearmint, coriander, hot pepper, lime juice, salt, pepper, olive oil and mix. 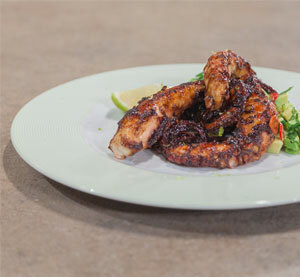 Heat some olive oil in a non-stick pan and sauté the boiled octopus so it develops a crust. Add the BBQ balsamic cream and mix. Serve the octopus with the avocado salad. Sprinkle with lemon zest and garnish with lime slices.